What To Consider When Buying A New Oven? The oven is undoubtedly the heart of your kitchen, it’s the one appliance which you’re likely to get the most use out of, so choosing the right one for you is very important. There are so many factors to consider when buying a new oven. What size should it be? Do you need one which is self-cleaning? Why might you want an internet connected oven? Who ever knew buying something as simple as an oven could be so confusing!! Let us take you step by step through how to buy a new oven. It’s that age old question: do you buy cheap to save yourself some money, or do you spend a bit more and get something that will last and that will give you a better experience. You can easily buy a cheap oven, but a good oven should last you 10+ years and should fulfil all of your cooking needs perfectly. Above all else, you need to ensure that the oven you’re purchasing is right for you, and that it won’t become a hassle, keep breaking down or become obsolete quickly. 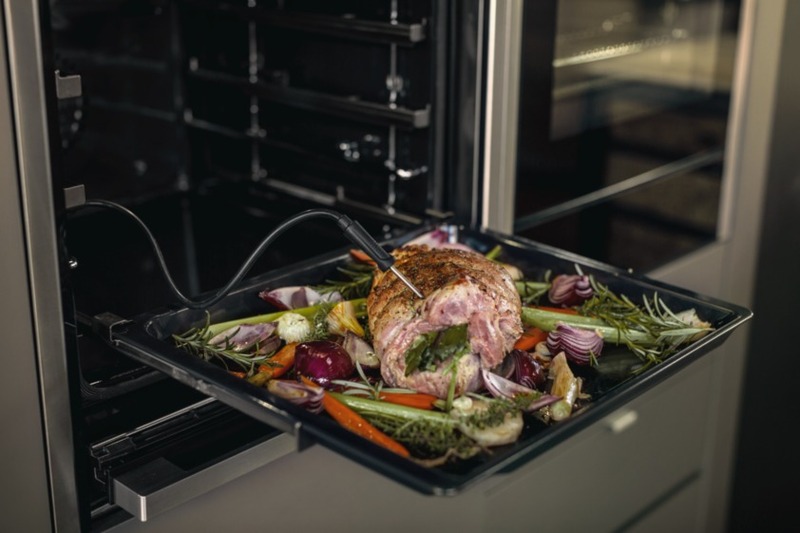 Today’s modern ovens come with an incredible range of hi-tech features and capabilities, such as telescopic rails, self-cleaning and steam cooking, but what are they and how will they improve your cooking? Let’s take a look at a few of the key innovations coming out for ovens at the moment. Digital controls – We all remember those ovens which have the ovens from years ago where they’re just a panel of knobs and switches to control everything, maybe a few of you even still have one. Digital controls give you much more control of your oven, enabling you to dial in exactly the temperature you need, essential for precision cooking. Plus, the digital control ovens often have timers and cooking settings built in, giving you even more control of your cooking. Programmable timers – We don’t mean those timers which count down from a set time and beep when they get to 0, we’re talking about timers which control your cooking. For example, some timers will reduce the temperature or turn your oven on/off after a set time. Slide and hide doors – This is one of NEFF’s patented features, enabling you to get even closer to your cooking. This is also a great feature if you’re in a small kitchen and don’t want to be tripping over the oven door whilst you’re rushing about. Telescopic runners – One of the most awkward actions in cooking food in the oven is checking on the food. Often you’ll need to pull the food out slightly to check on it, but the dishes/tray can be very hot and bulky. Telescopic rails make your life easier, they’re metal trays which sit on an extendable rail, meaning you can easily pull the food closer to you and check it properly. There would be nothing worse than spending hours on a dish then dropping it whilst you’re checking it! Steam cooking – Steam cooking is an incredible innovation. There are two types of steam cooking; full steam and vario steam (another NEFF innovation). The vario steam adds a small amount of steam to your cooking and is used to give your food a crisp surface, this is because as the moisture settles on your food, it evaporates, this causes a crispier surface and leaves the inside moist. The full steam option simply cooks the food using steam, which is a much healthier way of cooking because it leaves nutrients in your food and doesn’t use any oils or fats for cooking. 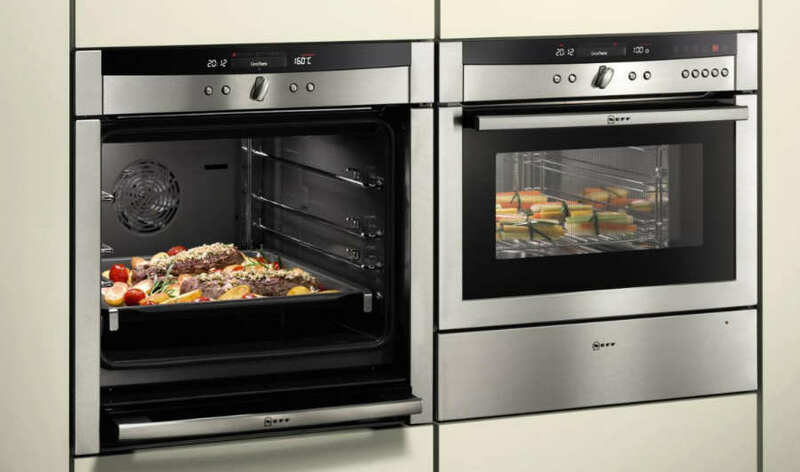 Internet enabled ovens – It seems that everything is becoming internet enabled these days, but perhaps connecting your oven to the internet might not be such a bad idea. 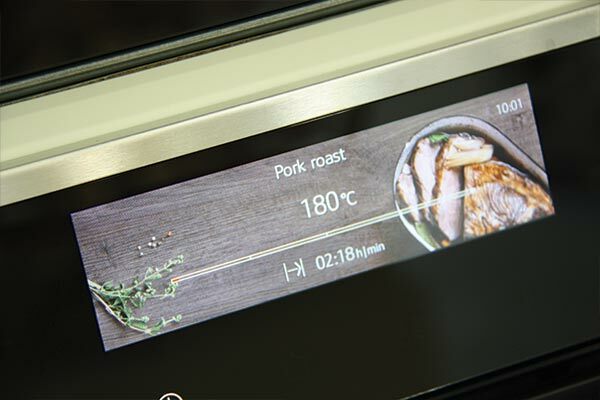 Manufacturers such as AEG, Bosch and Siemens have developed models which enable you to control some of the oven’s functions using your phone. Imagine putting your casserole in the oven in the morning before work, when you’re on your way home you turn your oven on, the casserole is cooked by the time you get home. These apps and ovens are getting smarter all of the time, right now you can turn your oven on/off and change the temperature, we look forward to seeing what the future holds in this area. Automatic cooking – No, this is not the oven doing all the work in your food preparation, but it’s not far off. This feature takes the hard work out of cooking meals, all you have to do is set the dish, the oven will do everything else for you. Some ovens now even come with a recipe function which will give you all of the information you need to put together an incredible meal. Integrated thermometer – OK, so you set your oven at 180 °C, but when you’re cooking meat you still need to keep checking the core temperature of the meat. Well now some NEFF ovens come with an integrated thermometer which plugs inside your oven, all you have to do is set the temperature you want the core of your meat to be and the oven will do the rest. The oven will even turn off when it gets to the right temperature, preventing an overcooked joint of meat. Can you turn the fan cooking off? If you’re a keen baker, you may need to have the option of turning off the fan cooking. It may sound silly, but some modern ovens are fan cooking only, not giving you the option of turning it off. This is important if you’re looking to cook crispy pizza bases or crusty pasty cases. What size oven should I buy? You have two options: single or double ovens. If you’re looking for a free standing oven, then you can find one in almost any size. However, for built in ovens you need to think a little bit more carefully, where you want to place the oven is often the determining factor. Built-under ovens (meaning those which fit beneath your worktop) come in either a large single or a small double format. Whereas if you have your oven at chest height, or in a larger unit with no worktop above, you could install a large double or even two singles. Think about how much space you have to play with and what be most practical for you. Also, it’s important that you check the exact external dimensions of your oven, because they can vary slightly between each manufacturer. Most of our customers will have a combination appliance (such as a compact microwave oven) as well as a single oven, this gives the benefit of not taking up valuable worktop space, as they would with a freestanding microwave. It also allows them to have extra cooking capacity when required, especially at Christmas time or holding dinner parties. Depending on the size of the kitchen and room available, some people like to include a bank of ovens. These may include a steam oven, combination microwave oven and either one or two single ovens, with the option of also adding warming drawers, which can be used for keeping food warm, slow cooking, keeping plates warm or even dough proving. What oven volume size do I need? The volume of ovens is often defined in litres, but this is of little use because it’s hard to get a true indicator of size from this. You won’t be able to use all of the internal space for cooking, some will need to be taken up with shelves, so make sure that you take a look at the internal layout and consider how much space there is for the type of dishes you’ll be cooking. Plus, read reviews and see what others say when using the oven. Remember, larger capacity doesn’t necessarily mean more space for cooking! Pyrolytic cleaning – This is a programme on your oven which locks the door and heats your oven up to 500°C. At this temperature, everything in your oven is obliterated, leaving just a pile of dust at the bottom which you can easily sweep up. This cleaning function is very environmentally friendly because no chemicals are needed. Catalytic liners – Often found on the back, roof or sides of the oven, these are liners which soak up fat and grease from the circulated air and slowly break it down using chemicals in the liners. For this to work best you need to run a cleaning programme in the oven every month. If you have a NEFF oven, these liners will last a life time. Steam cleaning – This is basically as you’d imagine, the oven injects steam into the oven and the grime is gradually broken down by the hot steam. However, you do still need to wipe down all of the surfaces with a cloth. Nano-cleaning surfaces – Called Eco clean on our NEFF ovens. This is a ceramic bead coating on the interior top, sides and back. All you need to do is put it on a cleaning programme and it takes the oven up to 275°C to remove burnt-on food without chemical cleaners. 2. The NEFF Circotherm oven with Variosteam, widely considered the best oven on the market. Things have definitely moved on in recent years, there is now incredible technology going into these ovens and they’re making cooking easier and easier. However, it can be bewildering choosing the right oven for your cooking needs. We hope this guide has given you some insight into the sorts of things you should consider when buying an oven. 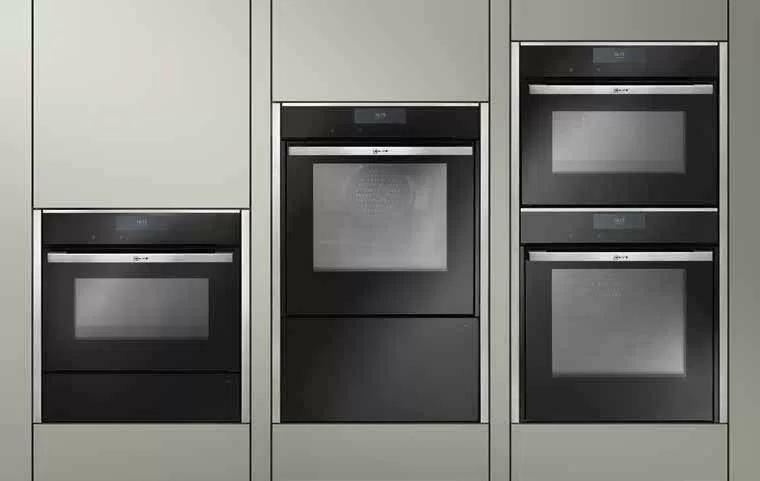 If you need any more help choosing the right oven for you please give us a call on 01223 213266 or email [email protected].